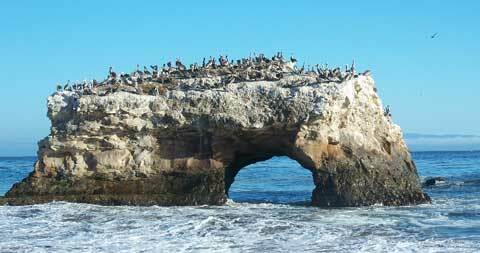 If it’s outdoor adventure you seek, Santa Cruz has a lot to offer. The following listings of beaches, whale watching, birding, fishing, horseback riding, and surfing opportunities aim to provide the kind of info you need to choose the outing for you. 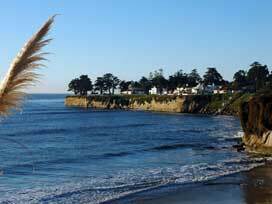 Santa Cruz County offers 29 miles of beaches from which to choose. If you are visiting the city for just a few days, try only the best ones. If you’re not from the area, its helpful to know that one stretch of sand may go by two or three names. Our list of the following 20 beaches uses the official names – the ones you’ll find on area signs. However, if you ask a local for directions, you may learn a few of the other names for your destination. Santa Cruz invites you down to Cowell Beach whether you want a nice place to walk the dog or you want to learn to the sport of surfing. 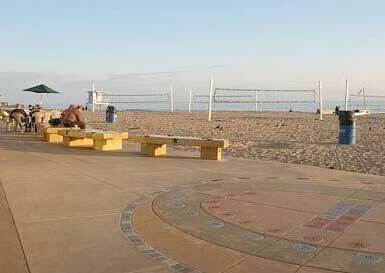 This beach features the boardwalk, the wharf, volleyball, frisbee, jogging, close to downtown, and it’s equipped with lifeguards in summer. Portions are available to rent for casual weddings, corporate beach parties. Visit www.santacruzparksandrec.com or call 831.420.5270 for more information. 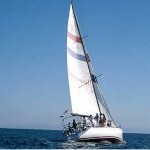 Whale watching is especially fun in the in the Monterey Bay area. Seven different species of whales and seven different species of dolphin & porpoise visit the area year-round. The humpback whale is the most common whale found out of Santa Cruz, seen usually from April through November. 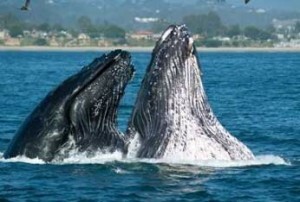 Then, from December through April, over 20,000 gray whales pass through the waters off Santa Cruz. Stagnaro Charters has a new passenger yacht and a 95% success rate with whales and dolphins. The narrated 3-4 hour trip runs year round and includes as much marine life as possible. Come aboard the 70-foot luxury sailing yacht to experience the perfect excursion. With Chardonnay II Sailing Charters, you can enjoy a myriad number of trip types, including Afternoon Pizza, Fireworks, Champagne Brunch, Sunday Sushi, Whale Watching, Sunset Sail, and so many more. Whether you’re new to sailing or a seasoned adventurer, Chardonnay II has much to choose from. Whale watching tour includes complimentary Champagne, orange juice, coffee, fresh pastries, and fresh seasonal fruit. During the months of March, April and May Kayak Connection paddles out into the bay to view the California gray whale on its trip to Alaska. The whales usually have their calves with them and the journey to their northern home is often slower and closer to shore, allowing easier views. Kayak Connection can make no guarantees of whale sightings but they do guarantee a good time! Note from the harbor: the docks at Santa Cruz Harbor were severely weakened and damaged by the March 11, 2011 tsunami are particularly vulnerable in the heavy swell and surge conditions typical of winter. If you plan to visit this winter, use caution dockside, watch for potential hazards, and report any issues to the harbor office at (831) 475-6161. 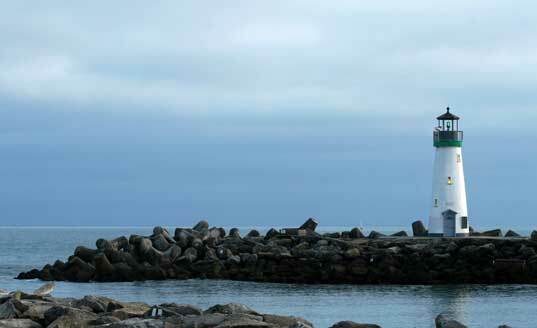 Santa Cruz Harbor is a full-service marina with charters offering sailing, fishing, whale watching, eco-tours, kayaking and more. 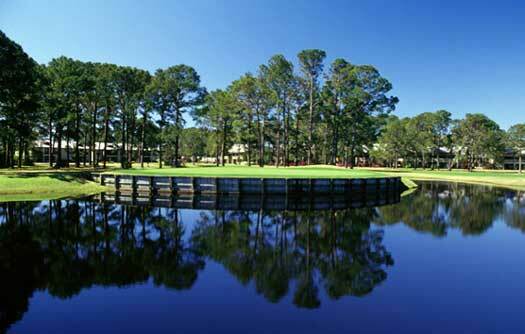 If you’d rather stay on land, enjoy restaurants, beach, RV park and retail shops. Choose from a 2 hour or all day guided kayaking tour. View all sorts of sea life including sea otters, seals, dolphins and whales. Check website for cost and tour dates. A wooden pontoon walkway and trail system allows bird watchers access around the refuge as they seek mallard and wood ducks, pied billed grebes, a multitude of coots, the world’s meanest geese, along with several varieties of fish and the occasional great blue heron or hawk. Park open from 7 until dusk when gates are locked. No dogs allowed in wildlife refuge area. 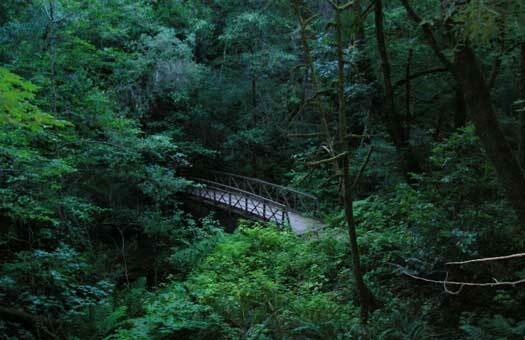 The Skyline Trail runs parallel to Skyline Boulevard and thus the ridge of the Santa Cruz range in a lush and mossy forest. This picturesque location is great for both hiking and biking along gentle rises and falls. The 32 miles of hiking and horseback riding trails feature views that are postcard perfect. With four trails to choose from, this spot can’t be beat for hiking. 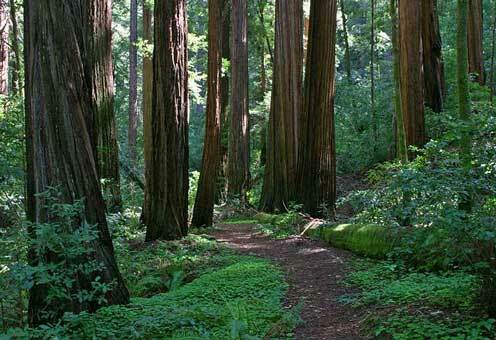 The shorter Redwood Grove Nature Trail takes you among one of the best first- growth redwood groves in Southern California. River trail travels along the east bank of the San Lorenzo intersecting Eagle Trail which leads out of the redwood forest along Eagle Creek. Pine Trail leads up to the observation deck, and River Trail’s steep decent takes you back to the picnic areas. This 7.7 mile multi-use trail is most popular with cyclists, but offers a moderately easy hike on dirt trails and fire roads. $10 entrance fee. Restrooms and drinking water at trailhead. Park is open from 8 a.m. to sunset. BMX bike park with a variety of jumps and trick elements. Open daily, 9am – sunset. Offering ocean beach rides on Monterey Bay. Accommodates riders age 8 and up; call in advance to schedule your ride. $65 and up; price contingent on the number of riders and the length of the ride. Riding lessons also offered at $35 and up. Horseback riding lessons offered to kids and adults of all experience levels. One hour lessons start at $35/ hour. Located on the Mitchell Ranch in Watsonville, CA. Summer camps also available. Ride and experience the beauty of Pebble Beach. The approximately hour long rides are offered to those age 7 and up, departing year-round, seven days a week at 10:00am, 12:00pm, 2:00pm and 3:30pm. Lessons, horse riding camps, and horse shows also offered. Call for pricing. Charted trips available for salmon, halibut, tuna, lingcod, sea bass and rockcod. Tours start at $130/ person or $650/ boat of 6 max. Charter includes rod, reel, bait, tackle kit and parking pass. All you need to bring is food, beverages and a fishing license. This charter company owned and operated by a certified U.S. Coast Guard Captain offers a variety of fishing opportunities. During the spring months, they generally fish for near- shore species like salmon, rock cod and halibut. During summer they target offshore albacore tuna. Group prices available, call for individual rates. Perched atop the hills surrounding Santa Cruz, this 18-hole championship golf course offers spectacular views, tree- lined fairways, deep canyons, and the infamous 10th hole. Full-service golf shop, restaurant, cocktail lounge and night-lighted driving range. Open daily, dawn to dusk. Built by world renowned golf architect, Alister MacKenzie, this semi-private top 100 course opens certain tee times for public play. Green fees up to $250; spectacular views of Monterey Bay. Located on the rolling hills of the northern Monterey peninsula, this classic course offers 18 holes with the sound of ocean waves in your ears. Also houses a well stocked pro shop, driving range, and 2 practice putting greens. This course has a unique history! If you are interested in golf, you may appreciate also our local golf course guide & review and Santa Cruz Disc golf courses and guide. Offers lessons in the full surfing experience by pro surfer Bud Freitas: standing up and riding the waves, ocean safety, surfing etiquette, and ocean knowledge critical to the sport. Cash or check only. 2) Richard Schmidt Surf School, Inc.
Santa Cruz’s original surf school has taught thousands with techniques that guarantee students will surf on their first day. Open daily, 9am – 5pm. Cowell’s Beach is the best spot in Santa Cruz for beginner surfers. $80 includes a board and wetsuit for the day and two hours of instruction. No experience necessary. Learn from an internationally renowned big wave rider with 40 years surfing experience. Group, semi-private, and private lessons available. See website for varying rates, $80 and up. Surfboards and wetsuits provided. Surfers coming to Santa Cruz may be interested also in the list of Santa Cruz surf shops.